This site was updated constantly on Sept 11. Please feel free to add new links here. September 11, 2001: A pair of jet planes crashed into each of the 110-story World Trade Center Towers in New York. Both Towers have been demolished. A third plane has crashed near or in the Pentagon building in Washington DC. A fourth passenger jet has crashed near Pittsburgh. 10:00AM, crash of UA93, Newark to SF, a 737 - hit ground 80 miles from Pitsburg PA, 45 people on board. I will be posting links to personal pages and public mailing lists in hope to find information that has not been shown on network broadcasts and websites. Phone Numbers: Please use sparingly! If you don't *have* to call, DON'T. A public discussion group at Yahoo has opened. Dave Winer, software developer keeps lots of links daily. A personal News Story collection and timeline. Stories of the WTC from years past. This picture was taken by a guy returning on a cruise July 28, 2001. It is a sunrise over lower Manhattan. 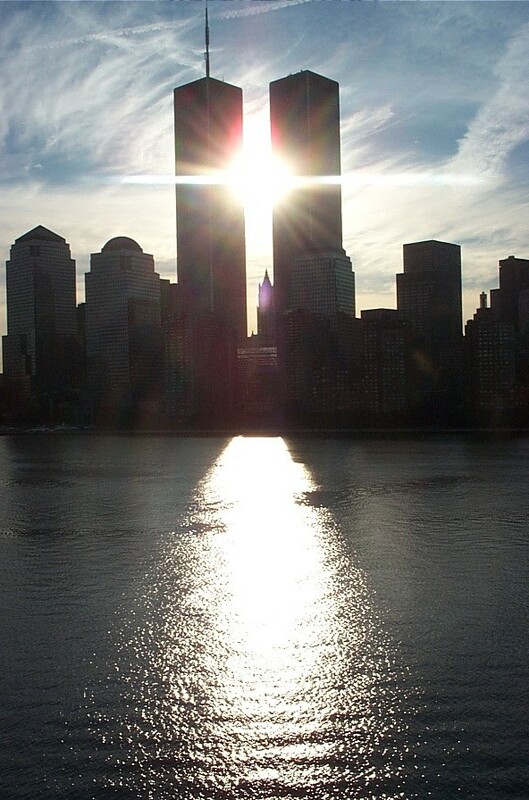 He Writes: As I watched the beautiful skyline of New York City float past me I noticed the sun was about to line up just behind the twin towers. I was lucky enough to snap the picture at exactly the right moment. If you look at the sun rays it is almost prophetic - a little spooky.